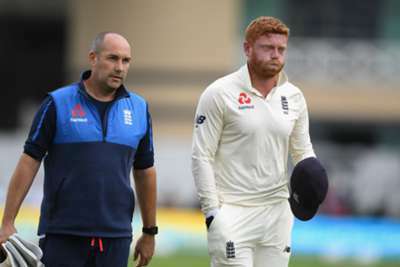 Jonny Bairstow suffered a small fracture to the middle finger of his left hand against India on Monday, England have confirmed. With the hosts struggling in the third Test, their day-three efforts were hindered by a blow to wicketkeeper Bairstow, the Yorkshire star looking in significant discomfort after misjudging an attempt to gather a delivery from James Anderson. Jos Buttler donned the gloves as Bairstow went for tests, with confirmation of a "small fracture" coming soon after as he iced his finger on the balcony in Nottingham. The 28-year-old is reportedly still expected to bat at Trent Bridge as England require an unlikely comeback to clinch the series after just three matches. Update: Jonny Bairstow has sustained a small fracture to his left middle finger.